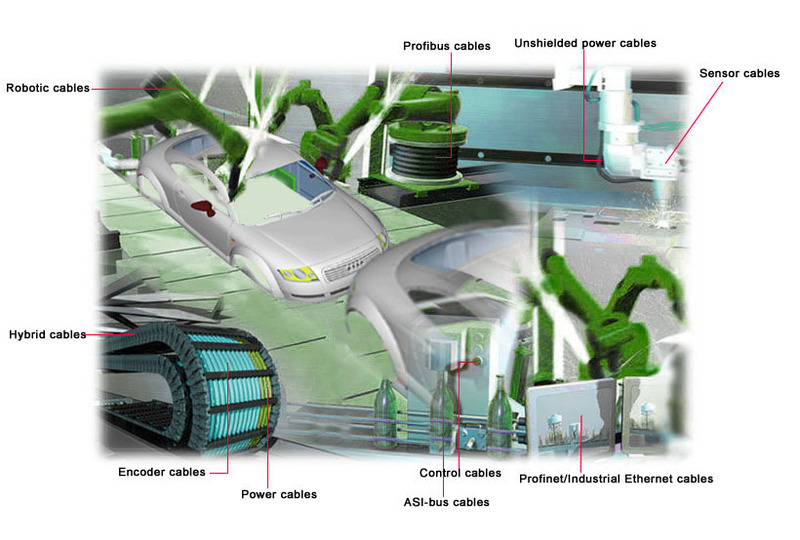 Robotic cables:Robotic cable can bend and twist for several million cycles in long-term tensional stress applications. The cable's smooth-core insulation and slip agents ensure consistent performance, making it a good choice for demanding automation applications, such as base-mounted or pedestal robots, pick-and-place robots, and rotary and swing tables. Profibus cables:A two-core round cable in a dozen designs for complex control. It is a 150ohm twinax (twisted pair) that used for process and field communication in cell networks. The Profibus protocol has been widely adopted for production and process automation applications. Unshielded power cables:Flexible power cables are used for portable and mobile tools and machinery. Used for servo-motors operating under hash environment. Sensor cables: To measure heat, position, liquid level, vibration, pressure, etc. The cable was designed to ensure the Temperature has the optimum thermal conductivity. Encoder cables: A type of control cable, connected to the control system is susceptible to damage. It can be covered up with saw dust and simply stepped on. Construction can be 4-15 cores depends on requirement.